We gladly accept SNAP benefits, WIC and Senior Vouchers. We are also delighted to participate in the Fresh Bucks program at our farmers market. This program matches SNAP benefits dollar-for-dollar (in $2 increments) with Fresh Bucks vouchers that can be used for fresh fruits, vegetables, and vegetable starts at the market. NOTE: Starting in 2018, there is no limit to the Fresh Bucks match! So customers literally double their spending power at the market. For example, if a customer spends $20 in SNAP benefits, they’ll get $40 total to spend at the market. Spend $40 in SNAP, get $80 to spend. Wow! 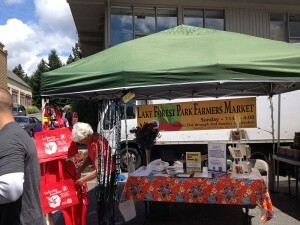 The Lake Forest Park Market also works with partner organizations and agencies to distribute Market Bucks, our food assistance program made possible with funding from Lake Forest Park Rotary, Lake Forest Park Garden Club, and donations from generous individuals like you. Market Bucks empower kids, families, and seniors who struggle with food insecurity to purchase fresh and healthy food at the LFP Farmers Market. Market Bucks are distributed to individuals and families in need through a variety of partners including Hopelink, the Center for Human Services, the Shoreline Lake Forest Park Senior Center, the Dale Turner YMCA, and individual schools in the Shoreline Public Schools District. By working with these invaluable community partners, we ensure that Market Bucks resources reach community members in greatest need. To find out about food assistance eligibility for yourself, or for a friend or relative, contact the Center for Human Services at 206.440.7300, or Hopelink at 425.869.6000. Both have offices in Shoreline.